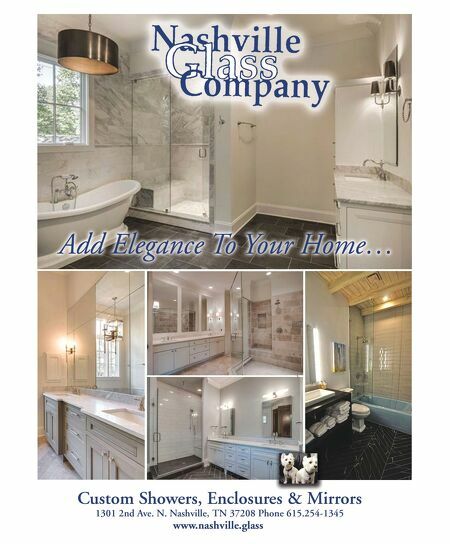 Nashville House & Home & Garden™ is the area's #1 luxury home and garden publication. We're devoted to everything for decorating and remodeling. G R E AT E R N A S H V I L L E H O U S E & H O M E & G A R D E N ™ 70 W hen homeowners want to increase their home's resale v alue, they turn to Property Brothers Jonathan and Drew Scott—and when Jonathan and Drew wanted to add wood beams to enhance a Nashville property for their show, their producers turned to TN Box Beams. "Wood beams are a hot, yet classic look," said Phil Stoner, president of TN Box Beams. "We were thrilled to join Jonathan and Drew on their set to feature our wood beams in an episode of "Property Broth- ers: Buying & Selling" that will air in the spring." TN Box Beams began when a local builder approached Stoner's craftsmen with a dilemma: Site-built box beams often develop unsightly gaps. "We love a challenge, so we tackled it head on," Stoner said. "We crafted a unique puzzle-fit joinery design, solved a common building and renovation problem, and TN Box Beams was born. Today we're a leading provider o f box beams." Customization options include design, dimen- sions, stains, rough or smooth finish and hand- applied textures. TN Box Beams also offers custom mantels, floating shelves, and corbels to complete the look. "TN Box Beams transforms raw wood into beautiful wood beams in our Franklin shop--but most important, our work trans- forms lives," said Stoner. TN Box Beams is a division of Narrow Gate Trading Co., and partners with Narrow Gate Lodge to instill craftsmanship and purpose in the next generation. 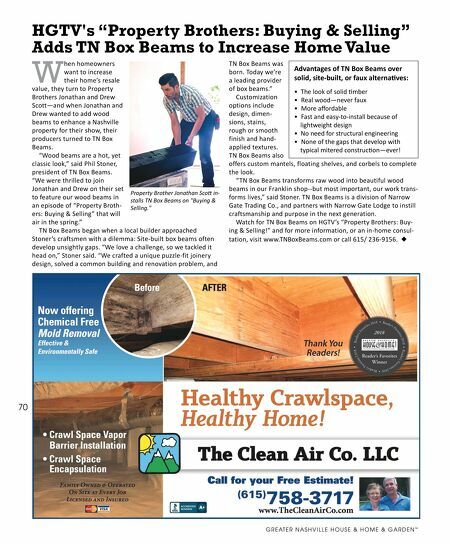 Watch for TN Box Beams on HGTV's "Property Brothers: Buy- ing & Selling!" and for more information, or an in-home consul- tation, visit www.TNBoxBeams.com or call 615/ 236-9156. ◆ HGTV's "Property Brothers: Buying & Selling" Adds TN Box Beams to Increase Home Value Property Brother Jonathan Sco in- stalls TN Box Beams on "Buying & Selling." Advantages of TN Box Beams over solid, site-built, or faux alternaves: • The look of solid &mber • Real wood—never faux • More affordable • Fast and easy-to-install because of lightweight design • No need for structural engineering • None of the gaps that develop with typical mitered construc&on—ever!